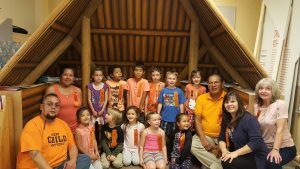 Set in the beautiful Okanagan Valley of British Columbia Canada, Senpaqcin School is a small independent, First Nations school on-reserve open to all. We provide quality education for children between the ages of 4 and 12 years old. Our School belongs to the Nk’mip people who are one of 7 Bands within the traditional lands of the Okanagan Nation. We are proud to be the first on-reserve authorized Primary Years IB World School in the North Americas. We believe that being part of IBO will help shift the stereotypes that exist within the country regarding First Nations education and that indigenous knowledge can be shared globally. 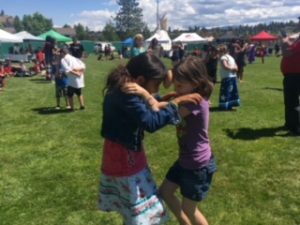 Our school is built on the foundation of indigenous knowledge (nsyilxcen) and the identity of the sqilxw people (Okanagan First Nations). Our mission is to explore our interconnectedness to the land locally and globally with a focus on stainability of the tmxwulʔxʷ (Earth). Our students participate in annual cultural experiences on the land. 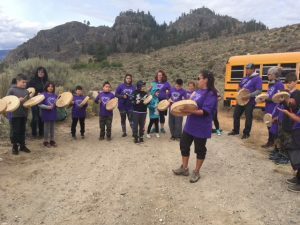 Through these hands-on learning experiences and the cultural captikwl stories, students compare the traditional beliefs and values of the Okanagan Nation and find similarities to other cultures around the world – past and present. The Okanagan Valley is known for its agricultural land use. 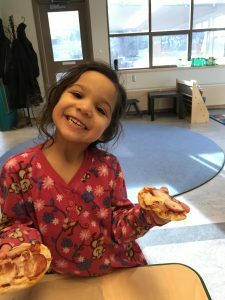 Our school is fortunate to have a 100 square metres of fenced garden space where the students are able to participate in a variety of learning experiences including planting, harvesting, and gathering of eggs for our lunch and breakfast programs. Students are able to have experiences that connect indigenous ways of knowing to current farming practices like planting using the ‘Three Sisters’ way of companion planting. Our second language is the nsyilxcen (Okanagan) which is the traditional language of the people. Much of the culture is embedded within the language. Many of the elders believe that if the language dies, a large piece of the culture will die with it. We are at a critical tipping point for ensuring that this language is not lost for future generations. SenPokChin is built on the foundations of indigenous knowledge, the identity and pride of sqilxʷ people (The Okanagan People). We explore our interconnectedness to the land’s natural resources locally and globally. SenPokChin understands that indignous knowledge and collaboration is fundamental to future sustainability of the tmxʷulaʔxʷ (Earth). It is the vision for SenPokChin to be the school of choice for the nk’mip people where the learning needs of all students are considered and parents and community members feel welcome. Our students have a strong desire to learn and have pride in their language, culture and heritage. Students are taught by dynamic, nurturing and qualified educators who support the First Nations philosophy of the intellectual, emotional, physical and spiritual development of the whole child. Relationships with student’s staff, parents and community are built on a foundation of respect, honor, caring and sustainability. There are many important terms that you and your child will be learning over the course of their experience in the Primary Years Programme. To help you better understand the new vocabulary and concepts, please click on the link below for more information. The International Baccalaureate Primary Years Program is constructed using a transdisciplinary framework. Students learn the mandated BC Curriculum content areas (knowledge) through 6 main Inquiry Units which are themed under the headings: Who We Are, Where We Are in Time and Place, How We Express Ourselves, How We Organize, How the World Works and Sharing the Planet. Each unit is carefully constructed using the 5 essential elements of the PYP programme. For a closer look at Senpacqin’s POI, click on the link below.